Switch back and forth between reading the Kindle book and listening to the Audible narration. Add narration for a reduced price of $14.97 after you buy the Kindle book. This book is great for getting your thoughts and feelings under control. I recommend you give it a try and put helpful suggestions and ideas into practice and see if you feel better. 4.0 out of 5 starsAn easy read. It is written in a language that I understand and on a subject that I I am currently researching. The style of writing is typically American in that it repeats itself. 5.0 out of 5 starsfeeling happy? 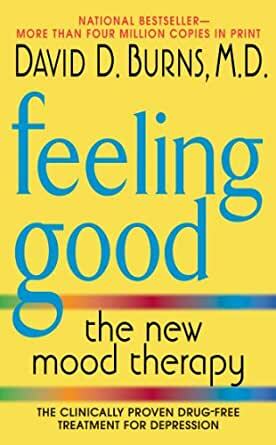 Feeling good; the new mood therapy by david d burns, m.d. captures multiple ways of transforming negative emotions into positive emotions. He also includes a practical chapter on gauging how angry a person can get and mentioning that IQ actually does not necessarily guarantee a better handle on the emotion of anger. He truthfully points out that some men and women with naturally higher IQs are actually more susceptible to being at a great disadvantage in overreacting to frustrations, disappointments, and allowing resentment to build in their hearts (starts on page 149). Of course, there is so much more helpful and insightful details in Feeling Good by David D. Burns. Let me start by saying I have been an Amazon customer for twenty years and I have *never* reviewed anything before. But I consider this book to important for me to keep my mouth shut. It was a life-changer for me. Don't know why some reviewers are saying it is not helpful for people with severe depression - maybe some people with severe depression need a different approach, but let me speak for the rest of us. I was having suicidal thoughts, and on the highest doses of meds available. I was also in therapy. I tried two different therapists, both of whom wanted to talk about other people in my life - my parents, my husband, etc. - which was not helping me at all. I was at my wit's end, really scared that I was going to hurt myself if things didn't get better soon, when a friend recommended this book. You have to do the exercises - yes, they seem silly, but if they work, who the heck cares? Get a nice little notebook and a pen that you enjoy writing with. I made mine a sort of journal that I doodled in and added little inspirational quotes here and there. And yes, it is deceptively simple. Again, who cares? If standing on my head and whistling "Dixie" would have made me feel this much better, I'd be doing that, too. I started reading the book a month ago. I do not do all the excercises, but I did try all of them. I do what works for me. It's also true that there is the usual filler crap that you get in self-help books "Janet is a 40-year old dental assistant who came to me in 2005 suffering from..." blah, blah, blah. Just skip it. My depression is so much better that I am shocked. I am no longer thinking about suicide, and I am actually able to picture a future that is not completely empty and black. A future!!!!!! I have not had a future in years! I can't express what that means to me, but if you have depression, I don't have to. Try the book. If it doesn't work, I hope you will try something else, and keep on trying. You are not alone, and you deserve to be happy. 1,233 people found this helpful. 5.0 out of 5 starsThis book should be required reading in schools in the United States. The ideas in this book are so simple, yet so powerful. We all have an inner voice (the Buddhists call it "monkey mind") that creates thoughts in our brain. These thoughts then make us feel a certain way. In knowing that our thoughts create how we feel, we can drastically improve the quality of our lives. This book shows that it's not what happens to us in life, it's what we think about it. For example, say you lose your job. Many people would then catastrophize and think negative thoughts about how awful it was, how we're going to be homeless and go broke and then we get depressed. Instead of thinking like that, we should think realistically about how it's tough that we lost our jobs, but we'll eventually find another one and that we will overcome the current crisis. I was a pessimist for years. Negative thinking becomes a habit and changes brain chemistry. By thinking more realistically and talking back to our negative thoughts, we can live much happier lives. 5.0 out of 5 starsJust Buy it, It works. It will make you feel better. Once you start reading this book, you will start to feel better. If you suffer with depression, this book is better than any prescription I have tried. It deals with the here and now, and teaches you how to understand your own negative contribution to your depression, and it gives you several tools with which you can assess where you are at, how you talk to yourself, how you interpret others, and how to regain control over that narrative. Best book that I have ever read. It made a difference just reading, but much more so by using the knowledge and tools that Dr. Burns provides in the book. I bought copies for friends and family who have also had learned how to feel better and even feel good. 5.0 out of 5 starsOn meds for depression or anxiety, read this book and change your life. I was fortunate to learn that the author was trained at my alma-mater, and it gave me the initial faith to read this book and do the work inside. This is university tested and developed Cognitive Behavior Therapy made available to anyone, it's success has been documented in over 40,000 patients in double-blind peer-reviewed studies. It changed my life. 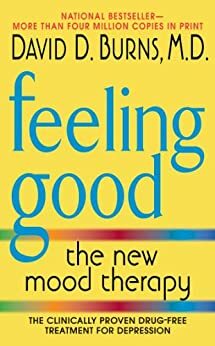 For 15 years I WAS anti-depressants and anti-anxiety medications, after reading this book, and doing the Cognitive Behavior Therapy exercises, I was able to wean myself off meds completely. Unfortunately, I've had to grapple with anxiety and depression most of my life. But you work with the hand you were dealt, am I right? On top of meds and therapy, I've amassed quite a collection of self-help books, some better than others. I try to be proactive in dealing with my business; I feel that's super important in helping deal with mental and emotional problems. For anxiety, I've found that books on mindfulness meditation to be quite helpful. For depression, stuff that emphasizes CBT is effective. That's why I like this book. It's written well, although some bits seem a bit dated (an example in the book of something that might irritate you is when you use your last dime at a payphone and the call drops and you don't get your money back. Little things like that pop up here and there in the book, but don't detract from the important things). I use some of the exercises in this book with a therapist which is helpful. There are exercises where the author asks you to write out things instead of mentally reviewing things. I agree with that recommendation. It helps solidify concepts and organize your thoughts. Hopefully you'll like it. Do the exercises, be honest in the exercises, and if you see a therapist try working through this stuff with them. My therapist knew who this author was right away and was familiar with his work. It's one of the few books like this that I own that I go back and review periodically.